Video tutorials, demonstrations, hints and tips. This informal video explains the new Active Contact features in arpReach. The powerful tagging, event and action micro-segmentation features are all explained in an easy to understand way. 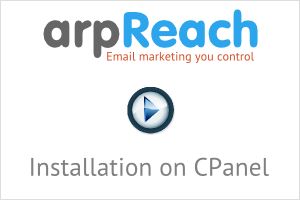 This video runs through the process of installing arpReach on a standard CPanel host. Examples include Hostgator, Liquid Web, JustHost and thousands of others. This video is for beginners and users new to arpReach. It covers signing in, changing your password and explains the screen layout and how to customize it to suit the way you work. It is assumed that you already have arpReach installed on your web hosting account or server. This video is about follow-up autoresponders. It covers the settings of a follow-up autoresponder including opt-in confirmation. It is assumed that you already have arpReach installed on your web hosting account or server and know how to sign in to arpReach. This video covers the autoresponder list screen, including the "with selected" options and the "I want to..." menus that appear throughout arpReach. 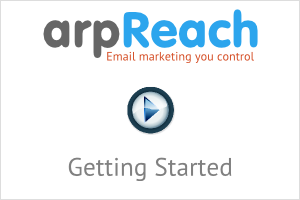 It is assumed that you already have arpReach installed on your web hosting account or server and know how to sign in to arpReach and how to create a basic autoresponder. It covers the creating of a follow-up message and all its settings. This video is for arpReach affiliates. It shows how to test that your affiliate link is working correctly.